RMS-300 has 4 latching power relays for remote control of AC/DC powered equipment. The relay will be toggled to the "Normally Open" position as shown below. For example; starting a generator. Below is a screen shot of making a relay script to toggle relay 1 on, wait 2 seconds, then toggle relay 1 off again. Each relay can have a name and its actions defined. Below is a screenshot of a relay script that turns a pump on for 30 minutes and then turns it off again. 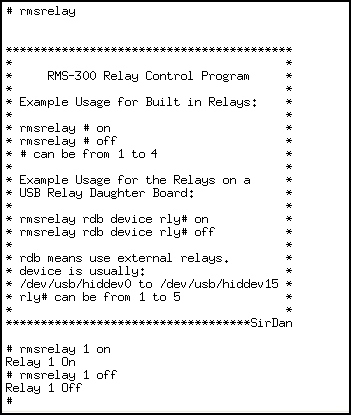 Control of the RMS-300 relays can also be done by using telnet or ssh. Below is an example of using the rmsrelay command to toggle relay 1 on and off. Below is an example of reading the status of Relay 1 using the command line interface. Note the relay1, relay2, relay3, and relay4 file will contain a "0" when the relay is in the "Normally Closed" position, and will contain a "1" when in the "Normally Open" position. 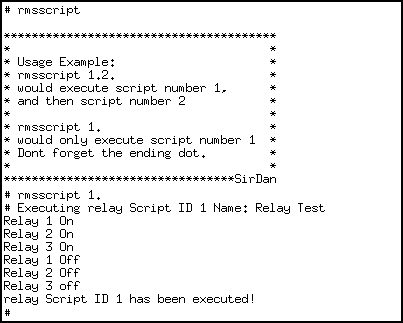 An example of running a relay script on the command line using the rmsscript program. The example below runs relay Script 1. PHP programmers may want to write their own programs to control the relays. Below are two example PHP functions that use the PHP system command to turn relay 1 on and off. The electrical ratings for the relays can be found here. The electrical ratings for the 12 position barrier strip can be found here.